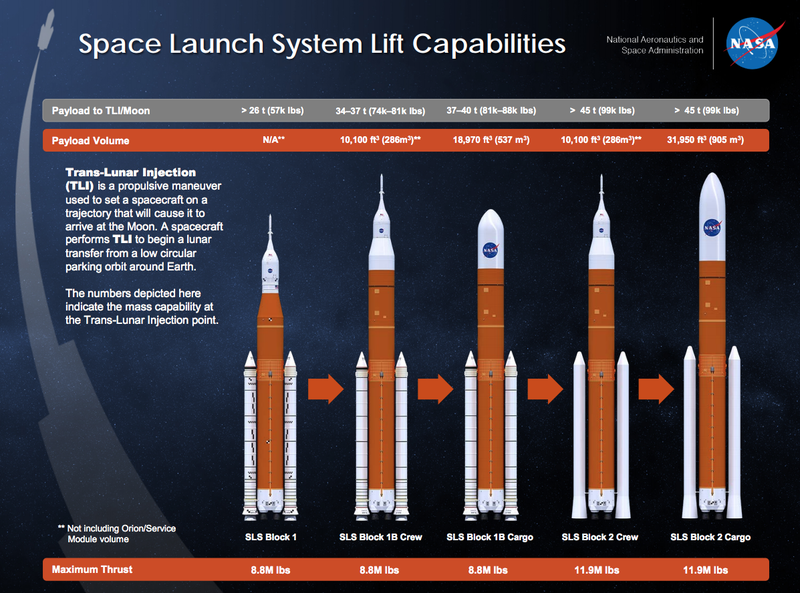 During a routine hearing with the House Subcommittee on Space on March 7, 2018, NASA’s then-acting administrator—Robert Lightfoot—said that, should NASA have a second mobile launcher (ML), the agency’s Space Launch System (SLS) may fly several times in the Block 1 form before the infrastructure is ready for the more-powerful Block 1B configuration of the super-heavy lift rocket. Exploration Mission-1 (EM-1) was to be the only mission to fly on the first-generation version of the rocket, but now may be joined several more missions utilizing the Block 1 design. This potential manifest shakeup comes from the funding for construction of a second ML, designated as part of the recently-passed Consolidated Appropriations Act. Though the agency had not requested funding for the second platform, it could allow NASA to fly crew significantly more quickly than it would have otherwise been capable of doing. “What the advantage of a second mobile launch platform gives you is I could fly on the mobile launch platform I’m building today, and I could potentially fly Orion if I bought another Interim Cryogenic Propulsion Stage—an upper stage—so I could fly quicker, fly humans quicker, probably in the 2022 time frame,” Lightfoot told the Subcommittee when asked what would be the advantage of a second ML. NASA had projected a pause of at least 33 months between the first two SLS flights as the agency worked to modify the sole platform to support the larger Block 1B vehicle. However, with the construction of a new ML now funded with a $350 million appropriation, NASA could—theoretically—cut that gap by a significant margin. While the option to fly crew sooner on SLS may appear to be a no-brainer, it doesn’t come without complications. Block 1 of SLS uses a modified Delta Cryogenic Second Stage from a United Launch Alliance (ULA) Delta IV rocket for its second stage. 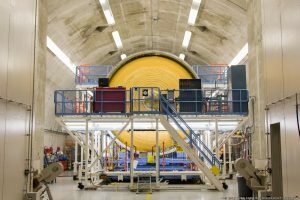 In its SLS configuration, the propulsion element is known as the Interim Cryogenic Propulsion Stage (ICPS), but NASA has only purchased one flight unit from the company. With vehicle components, especially those related to propulsion, taking months—or even years—to manufacture, any shortening of launch gap could be erased if NASA doesn’t procure an additional ICPS in a timely manner. Additionally, and crucially, the ICPS has not been rated to fly a crewed vehicle. In order to certify the Delta IV-derived stage for human spaceflight, the ICPS would likely have to undergo costly and time-consuming tests before the agency could launch astronauts on Exploration Mission-2 (EM-2) using a Block 1 SLS. Moreover, NASA’s Europa Clipper mission—which is congressionally mandated to launch on SLS—may now fly on a Block 1 vehicle rather than the more powerful Block 1B. The super-heavy-lift-vehicle has the capability to deliver a greater payload to the Jovian system without the need to use a series gravity-assist maneuvers that would be required should the spacecraft fly on a less-expensive, less-capable rocket. However, the spacecraft was planned to fly on the more-powerful Block 1B version, which would include a new Exploration Upper Stage (EUS). Should the mission fly on a base Block 1 vehicle, it is less clear if the time-saving is still enough to justify flying on SLS. SpaceFlight Insider has reached out to NASA to see what impact, if any, flying Europa Clipper on a Block 1 may have on the mission and will provide an update when that information becomes available. Should the U.S. space agency decide to wait until Block 1B’s more-capable EUS is ready, flights of that configuration could have to wait until the mid-2020s should development of the new cryogenic stage take longer than expected. The SLS is nothing more than an enormous workfare cash cow for Boeing and ULA. Any further delays will certainly jeopardize future missions. I’ve been on the record for cancellation of this project for 2-3 years already, and Congress just keeps throwing taxpayer dollars at this enormous white elephant of a project. By the time it actually flies the first time, it will be obsolete in light of New Glenn and BFR. The main issue is that SLS Block 2, which is meant to be the most powerful version, will be too late to make any difference if BFR flies within the next 7-10 years which I think is likely. At the very least SpaceX should get the cargo version ready within the next 5-7 years which is poised to outperform SLS (even Block 2) on more or less every front. The only apparent advantage for Block 2 is that it’s set to have a slightly larger fairing diameter (10 meters?). Based on what I can tell, all other versions of SLS are majorly inferior to the BFR designs in just about every way and SLS Block 1 without the exploration stage is not much more useful than the Falcon Heavy in terms of capability, certainly not in any way that would justify the massive cost premium. If one could at least say that SLS (even on paper) is way more powerful than the BFR, then we could talk about a potential justification for the cost but this is not the case and the reality seems to be the exact opposite. For the money that was spent, SpaceX could probably produce the gigantic ITS that was presented before the downgrade to BFR. I wouldn’t be surprised that with such funds, they could also get the ITS flying regularly before SLS Block 2 ever reaches the first test flight (sometime in the mid 30s?). If all goes well, it may even happen that SpaceX produces the BFR and eventually even the ITS upgrade through private investment and before SLS Block 2 ever flies.